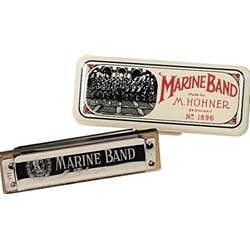 The Hohner 1896 Marine Band Harmonica follows in has been played by world-famous musicians like John Lennon, Bruce Springsteen, Little Walter, and Paul Butterfield. The Hohner Marine Band is a number-one choice among top professionals and one of the most recognizable harmonicas all over the world. Known for its full tone, wood comb, and its patented cover plates, the Marine Band harmonica was there when harmonica blues was born. The Marine Band harp is a result over 100 years of Hohner German craftsmanship.